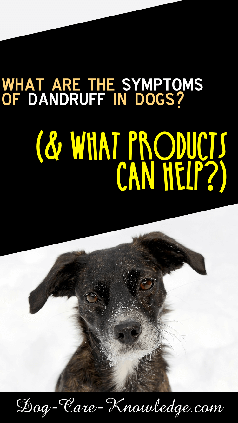 Dandruff in dogs has two main forms; either dry or oily. The main symptom is itchy skin and white flakes. Other sympoms can include scabs, sores, bumps, and pimples. In either case, frequent bathing with the appropriate dandruff shampoo specially formulated for dogs, is the best treatment. We have two shampoos that treat dandruff in dogs; Tar & Sulphur and Derma-Dyne. Both of these can be used for both oily and dry dandruff but I would recommend Tar & Sulphur if your dog just has flaky skin and Derma-Dyne if they experience any other symptoms such as scabs and sores. In either case it's best to finish with a re-moisturizing rinse to help restore your dog's skin and coat. I recommend using Nature's Specialties Re-moisturizer with Aloe. The best way to use the Nature's Specialties shampoos is to dilute in warm water using ashampoo mixing bottle. This makes bathing easier and your shampoo last longer. It also allows even distribution of the shampoo and makes it much easier to lather correctly without over shampooing. You can also use an anti-itch spray to help relieve any really itchy areas immediately. I recommend Nature's Specialties Wham Anti-itch Spray.